Born in Nice in 1928, Armand Pierre Fernandez showed a precocious talent for painting and drawing as a child. (Inspired by Vincent van Gogh, he signed his early work with his first name only; he retained a printer’s 1958 misspelling of his name for the rest of his career.) The son of an antiques dealer and amateur cellist, the artist absorbed an intense appreciation for music, the art of collecting and the cultivation of discriminating taste from an early age. After studies at the Ecole Nationale des Arts Décoratifs in Nice, Arman decamped to Paris to study art history at the Ecole du Louvre. His work in these early years focused on abstract paintings inspired by the work of Nicolas de Staël. 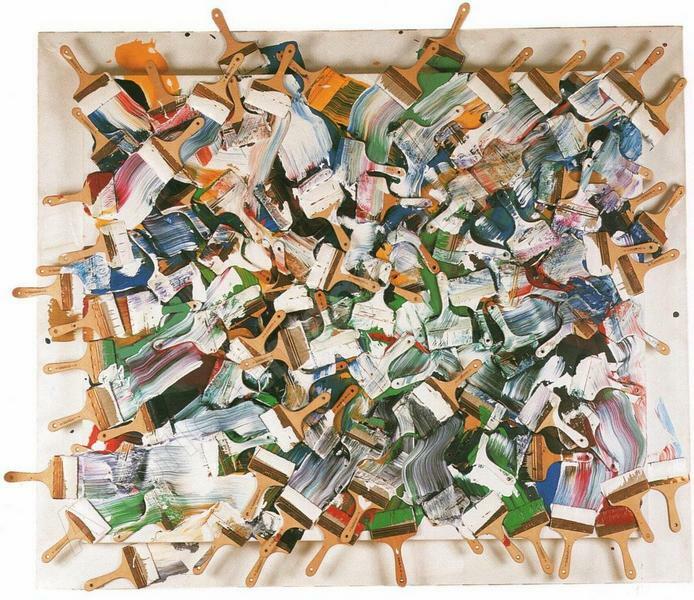 An avid reader, Arman sought inspiration through books and art reviews, as well as during frequent road trips throughout Europe with his artist friends from Nice, Claude Pascale and Yves Klein. During this period, Arman developed a passion for Eastern philosophy, early Chinese art and the martial art of judo, even working as an instructor at the Bushido Kai judo school in Spain. Additionally, he served two years as an orderly in the French military in Indochina. Inspired by the Dadaist collages of Kurt Schwitters, Arman’s first solo show, in Paris in 1954, exhibited his “Cachets,” assemblages and accumulations of stamps and fabric that were to prove an important step in the development of his artistic vision. More consequential yet was his signing, in 1960, of the manifesto of the “Nouveau Réalisme” (New Realism) movement, with fellow artists Klein, Martial Raysse and Jean Tinguely, among others. “New Realism equals new, sensitive, perceptive approaches to the real,” asserted the document, and Arman set out on a new course, in which he would re-examine the artistic possibilities of everyday objects, elevating the banal to the aesthetic, and refuse into art. The same year, Arman had a Landmark exhibition at the Iris Clert Gallery in Paris, “Full Up” (“Le Plein”), an audacious installation/happening that filled the entire gallery with garbage. In 1961, he unveiled yet another of the many “strategies” he would employ over his career: the “colères,” manmade objects he would smash, then reassemble and mount on wood panels. These well-known works, together with his “coupes” (“slicing”)—objects (frequently mass-produced) he would cut apart then put on display—and his “combustions”—objects he set ablaze, and whose charred remains he exhibited—represented acts of artistic creation through destruction. They exemplified the way Arman continually compelled viewers of his work to re-evaluate their ideas with respect to beauty and fine art. Enamored by the artistic energy of New York in the ’60s, Arman moved into the Chelsea Hotel in 1967, and became an American citizen (adopting the official name of Armand P. Arman) in 1973. As he established himself in New York, his projects became ever more ambitious and prolific, and featured accumulations of tools, clocks, jewelry and countless other materials. He would weld hundreds of these objects together into sculpted formations, some only centimeters high, others filling entire rooms. He would encase the objects in polymer resin to form optically intriguing showcases for them. He was the first contemporary artist to receive commissions from the Renault car company; this collaboration resulted in a series of works using car parts which Arman exhibited at the 1970 World’s Fair in Osaka, Japan. He also drew intense inspiration from the sinuous shapes of string and brass instruments—and harnessed his longstanding appreciation for music—to create countless accumulations and “coupes” of cellos, violins, and trombones; these are perhaps his most widely known works. Arman brought his techniques to bear on public, monumental sculpture as well. His “Long-Term Parking,” created in 1982 in the Parisian suburb of Jouy-en-Josas, is a 50-foot-high column of concrete that encases dozens of cars. Yet more monumental is his “Hope for Peace” (“Espoir de Paix”), commissioned in 1995 by the then Lebanese Prime Minister Rafik Hariri to stand alongside the Lebanese Army Headquarters in Beirut. Towering even higher than “Long-Term Parking,” “Hope For Peace” encases armored vehicles and tanks, whose barrels poke out through the concrete, pointing upwards. Later in his career, Arman returned to painting. In 1989 he exhibited paintings at New York’s Vrej Baghoomian Gallery and, in 1995, he exhibited a series of paintings inspired by Van Gogh’s “Starry Night.” He produced several series of monochrome paintings, often using the paint tubes themselves on the canvases in addition to the paint they contained. In 1991, he unveiled a series of “robot-portraits” of classical composers—from Bach and Beethoven to Wagner and Arman’s contemporary Philip Glass. These large-scale works evoked their subjects through assemblages of such objects as sheet music and instruments. Throughout his career, Arman remained passionately engaged with human rights issues important to him. For five years, he served as President of the New York Chapter of Artists for Amnesty International. In 1990, on the occasion of a major retrospective of his work that was to be the inaugural attraction at the Museum of Contemporary and Modern Art in his hometown of Nice, Arman made a major statement against religious prejudice. Only weeks before the scheduled opening, Nice hosted the convention of the Front National, a right-wing French political party whose guest of honor had been a German Neo-Nazi. The Mayor of Nice honored the F.N., and in the uproar that followed made anti-Semitic remarks. In protest, and in staying true to his convictions, Arman cancelled the retrospective, and, as a consequence, waited until 2002 for his work to be exhibited in the city of his birth. Some friends had advised Arman not to mix politics with art. He responded, “If you are not willing to mix with politics sometimes, politics may one day mix with you—whether you want it or not.” Over the course of his career, Arman had over 600 one-person shows, and was the subject major retrospective exhibitions at the Houston Museum of Fine Art, in 1991, and at the Galerie Nationale du Jeu de Paume in Paris, in 1998. Though Arman passed away in October 2005, the efforts of his wife of 34 years, Corice Canton Arman, and of the Arman P. Arman Trust, continue to ensure that his remarkable legacy—his ability to transform and elevate, his political engagement and his incisive humanism—will continue to affect and influence the world he loved so much.